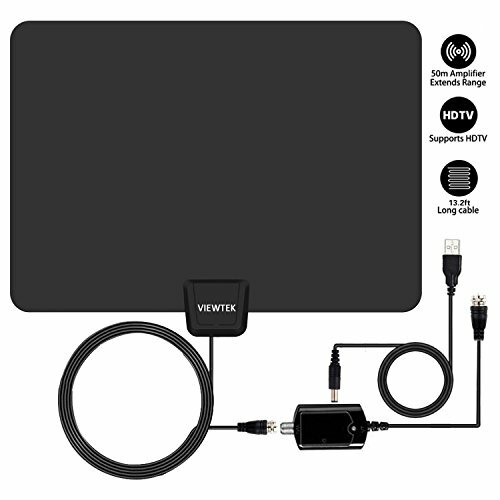 Viewtek Indoor Amplifier HDTV Antennas 50 Miles is specially designed for receiving digital over-the-air(OTA)TV broadcasts from local television stations and can pull in all of your local news,weather,sitcom,kids and sports programming with no monthly contract or bills.Enjoy crystal clear HDTV shows,720P Just plug it into your television and let the antenna do all the work. Sobetter TV Antenna isn't just an antenna-it's a passport to freedom.Your cable company doesn't want you to know this but u can still get lots of channels right over the air and for free. Super soft,unobtrusive design and powerful reception capabilites make the antenna a top choice in any home.It can be safely painted to match any home decorating without affecting reception or signal loss. 1.Connect to 'ANT IN' on the back of any digital-ready TV. 2.Place the antenna in an optimal position,usually on a wall or window. 3.Scan Channels by selecting 'Menu' then 'Channel Search' and you are ready to enjoy your free tv. 4.Paste on the table or bookshelf. The number of channels you get is determined by what's being broadcast in your area,how far away you are from the towers,and your surroundings.We do offer a 30-day money back guarantee in order for you to test the suitability in your area(conditions apply). 50 Miles Long Range: The HDTV antenna amplifier boosts the TV antenna with better signal, enjoy crystal clear HDTV shows, 720p, 1080i, 1080p | ATSC available. High quality keep the best signal transmission Protection against interference with other signals. The amplified can strengthen signals, you can say goodbye to weak signals and blurred pictures. But Channel reception may vary depending on what's broadcasting in your area, distance from broadcast towers, terrain and the surroundings.